<h2>Flat-pack homes and profit-sharing retrofits are making sustainable housing affordable</h2><br /><p>‘One of the biggest problems that we see right now is (the creation of) a big gap between the lower and the middle classes. Everyone is talking about this growing inequality gap,’ said Bart Glowacki, co-founder of <a href="http://startuppoland.org/en/startup/solace-2/" target="_blank" rel="noopener noreferrer">SOLACE</a>, a start-up based in Warsaw, Poland, set up with the aim of making sustainable housing widely affordable.</p> <p>Tighter mortgage controls, job insecurity and high student debts in Europe has meant that it is increasingly difficult for young people to buy their own homes.</p> <p>‘Ordinary people are no longer able to afford their basic needs. Millennials, who are the future leaders, can’t even afford an apartment or a house,’ said Glowacki.</p> <p>Yet, as inequality grows, public awareness about the environment, climate change, energy efficiency and sustainability are on the rise. According to a <a href="https://ec.europa.eu/clima/sites/clima/files/support/docs/report_2017_en.pdf" target="_blank" rel="noopener noreferrer">2017 Eurobarometer climate change report</a>, about three-quarters of Europeans believe climate change is a serious problem while 90% have taken actions to combat it.</p> <p>With these issues in mind,&nbsp;SOLACE has developed an energy-neutral flat-pack house targeted at people aged between 28 to 38. SOLACE makes, sells and ships the house parts. Right now, they have built one house that will serve as an exhibition model for potential clients, but Glowacki says that small-scale production will start soon and they hope to secure more funding to scale up.</p> <p>SOLACE’s house costs €25,000 and is delivered in a package of about&nbsp;6m long. It can be assembled by four people using a crane, but the start-up supplies assembly teams if required. The house consists of a small kitchen, a 20m2 living-dining room and a small bathroom on the ground floor, and a mezzanine level bedroom.</p> <p><strong>Surplus energy</strong></p> <p>While other flat-pack houses exist, SOLACE's innovation&nbsp;is a roof of solar panels which powers the home, but also earns income for the homeowner by producing surplus energy which in certain countries can then be sold to the local power grid.</p> <p>‘We believe that SOLACE house is the first house in Europe that actually can produce more energy than the average family consumes,’ said Głowacki, although he admits that customers in countries with less sun exposure during the winter months would only benefit from reduced environmental impact and energy bills.</p> <p> <div class="quote-view quotesBlock quote_horizontal"> <div class="quotesTop"><img src="https://horizon-magazine.eu/sites/all/themes/horizon/images/quotes_top.png" alt="" title="" /></div> <p>'We believe that SOLACE is the first house in Europe that actually can produce more energy than the family uses. '</p> <blockquote><p>Bartek Glowacki, co-founder of SOLACE</p></blockquote> <div class="quotesBottom"><img src="https://horizon-magazine.eu/sites/all/themes/horizon/images/quotes_bottom.png" alt="" title="" /></div> </div> </p> <p>‘When a family spends more than 40% of their disposable income (on heating and electricity costs), they will pretty much cash out every end of the month, because the housing overburden is too heavy for them, said Głowacki, who believes that utility costs financially cripple households. ‘We think that SOLACE can really fight this.’</p> <p>But it's not just individuals who could have an incentive to invest in sustainable housing. A pilot project called LEMON plans&nbsp;to assist and encourage private companies to invest in retrofits for existing social housing in Italy through an <a href="https://ec.europa.eu/energy/en/content/energy-performance-contracting" target="_blank" rel="noopener noreferrer">EU scheme</a>.&nbsp;</p> <p>The scheme, usually applied to large public construction projects, enables investors to profit from the energy savings generated by the retrofits. It’s the first time that such an initiative has been rolled out in Italy, according to Dr Claudia Carani, coordinator of LEMON.</p> <p>‘We need to show a different business model that could be really interesting to accelerate investment,’ said Dr Carani.</p> <p><strong>27 towns</strong></p> <p>LEMON will tender contracts in September and retrofitting will begin in 2019 in 27 towns in two Italian provinces, Reggio Emilia and Parma. The 622 houses that will be retrofitted are currently highly inefficient, averaging a G rating according to the <a href="https://ec.europa.eu/energy/en/topics/energy-efficiency/energy-efficient-products" target="_blank" rel="noopener noreferrer">EU energy labelling scheme</a> in which A is highly efficient. LEMON plans to bring these homes up to a C rating by replacing the windows, changing the heating system for a modern boiler-based one and installing smart temperature control systems.&nbsp;Dr&nbsp;Carani says these changes would generate €15,290 million in energy savings.&nbsp;</p> <p>The project also plans to teach the residents, a mix of locals and migrants, how to use the new retrofits which will provide better insulation and reduce heating costs.</p> <p>Elsewhere, grassroots organisation Czech Sustainable Houses wants to make sustainable homes more widely available by driving the need for such housing. Part of how they do this is by pushing innovation for sustainable housing forward – not least, through their annual architecture student competition.</p> <p>Currently in its third year, the contest asks students in the Czech Republic and Slovakia to design sustainable, attractive and economically viable houses.</p> <p>‘A large part of our activities is making sure that we communicate in a way that people get excited and give them a good feeling that there is a good future waiting for them,’ said founder Pavel Podruh.</p> <p>While the contest criteria change every year - this year’s brief is to design a complex of five buildings each with three apartments - Podruh says a critical test is viability.</p> <p>The prize is judged by a jury comprising of architecture, science and energy experts and the winners receive 30,000 Czech koruna, equivalent to EUR 1,170 while their sketch is converted into a life-size liveable prototype. The first two will be completed next year. When the prototypes are ready, the public will be able to rent them out for short stays to experience sustainable living.</p> <p>‘Anyone can stay in these houses and try this new way of living and see that it’s not so different to what they are used to,’ said Podruh, whose organisation won first prize in the Young Energy Leaders category of the EU Sustainable Energy Awards in June.</p> <p>The organisation has no plans to commercialise the prototypes. Instead, their goal is to highlight the need for sustainable housing initiatives and spur governments, policymakers and private companies into action.</p> <p>‘We really want to create a large demand for houses. We are intentionally creating this pressure on the market to adjust, to innovate,’ said Podruh. ‘We never wanted to be a construction company - we show novel ways to build houses, and we create the demand but we don’t satisfy it – intentionally.’</p> <p><em>SOLACE and LEMON are funded by the EU.&nbsp;If you liked this article, please consider sharing it on social media.</em></p> <p><a href="http://bit.ly/newsalertsignup" target="_blank" rel="noopener noreferrer"><img src="https://horizon-magazine.eu/sites/default/files/news-alert-final.jpg" alt="" width="983" height="222" /></a></p> <br /> <img src=”http://www.google-analytics.com/collect?v=1&tid=UA-40077089-1&cid=flat-pack-homes-and-profit-sharing-retrofits-are-making-sustainable-housing-affordable&t=event&ec=republish&ea=read&el=flat-pack-homes-and-profit-sharing-retrofits-are-making-sustainable-housing-affordable&cs=republish&cm=republish&cn=republish&cm1=1" /> This post <a href="https://horizon-magazine.eu/article/flat-pack-homes-and-profit-sharing-retrofits-are-making-sustainable-housing-affordable_en">Flat-pack homes and profit-sharing retrofits are making sustainable housing affordable</a> was originally published on <a href="https://horizon-magazine.eu/">Horizon: the EU Research &amp; Innovation magazine | European Commission</a>. Wealth-generating, flat-pack solar houses and a profit-sharing scheme that incentivises retrofitting are bringing sustainable living to people who would otherwise not be able to afford it. ‘One of the biggest problems that we see right now is (the creation of) a big gap between the lower and the middle classes. Everyone is talking about this growing inequality gap,’ said Bart Glowacki, co-founder of SOLACE, a start-up based in Warsaw, Poland, set up with the aim of making sustainable housing widely affordable. Tighter mortgage controls, job insecurity and high student debts in Europe has meant that it is increasingly difficult for young people to buy their own homes. ‘Ordinary people are no longer able to afford their basic needs. Millennials, who are the future leaders, can’t even afford an apartment or a house,’ said Glowacki. Yet, as inequality grows, public awareness about the environment, climate change, energy efficiency and sustainability are on the rise. According to a 2017 Eurobarometer climate change report, about three-quarters of Europeans believe climate change is a serious problem while 90% have taken actions to combat it. With these issues in mind, SOLACE has developed an energy-neutral flat-pack house targeted at people aged between 28 to 38. SOLACE makes, sells and ships the house parts. Right now, they have built one house that will serve as an exhibition model for potential clients, but Glowacki says that small-scale production will start soon and they hope to secure more funding to scale up. SOLACE’s house costs €25,000 and is delivered in a package of about 6m long. It can be assembled by four people using a crane, but the start-up supplies assembly teams if required. The house consists of a small kitchen, a 20m2 living-dining room and a small bathroom on the ground floor, and a mezzanine level bedroom. While other flat-pack houses exist, SOLACE's innovation is a roof of solar panels which powers the home, but also earns income for the homeowner by producing surplus energy which in certain countries can then be sold to the local power grid. ‘We believe that SOLACE house is the first house in Europe that actually can produce more energy than the average family consumes,’ said Głowacki, although he admits that customers in countries with less sun exposure during the winter months would only benefit from reduced environmental impact and energy bills. But it's not just individuals who could have an incentive to invest in sustainable housing. A pilot project called LEMON plans to assist and encourage private companies to invest in retrofits for existing social housing in Italy through an EU scheme. The scheme, usually applied to large public construction projects, enables investors to profit from the energy savings generated by the retrofits. It’s the first time that such an initiative has been rolled out in Italy, according to Dr Claudia Carani, coordinator of LEMON. ‘We need to show a different business model that could be really interesting to accelerate investment,’ said Dr Carani. LEMON will tender contracts in September and retrofitting will begin in 2019 in 27 towns in two Italian provinces, Reggio Emilia and Parma. The 622 houses that will be retrofitted are currently highly inefficient, averaging a G rating according to the EU energy labelling scheme in which A is highly efficient. LEMON plans to bring these homes up to a C rating by replacing the windows, changing the heating system for a modern boiler-based one and installing smart temperature control systems. Dr Carani says these changes would generate €15,290 million in energy savings. The project also plans to teach the residents, a mix of locals and migrants, how to use the new retrofits which will provide better insulation and reduce heating costs. 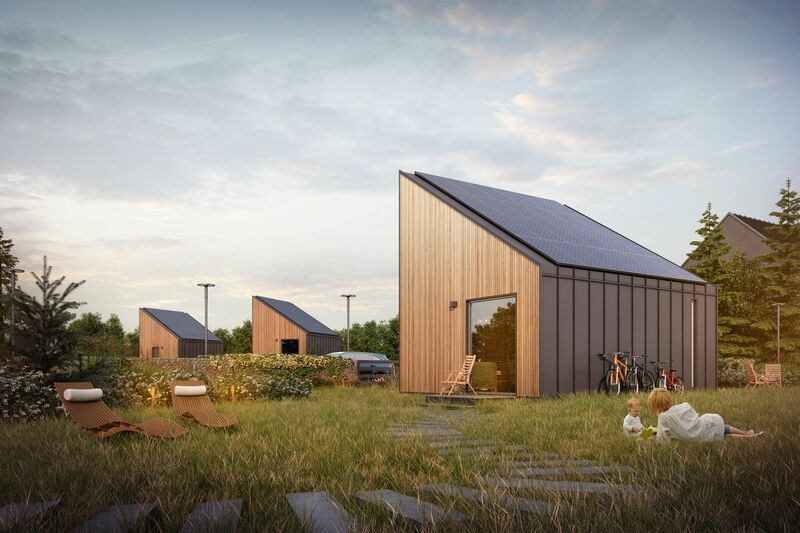 Elsewhere, grassroots organisation Czech Sustainable Houses wants to make sustainable homes more widely available by driving the need for such housing. Part of how they do this is by pushing innovation for sustainable housing forward – not least, through their annual architecture student competition. Currently in its third year, the contest asks students in the Czech Republic and Slovakia to design sustainable, attractive and economically viable houses. ‘A large part of our activities is making sure that we communicate in a way that people get excited and give them a good feeling that there is a good future waiting for them,’ said founder Pavel Podruh. While the contest criteria change every year - this year’s brief is to design a complex of five buildings each with three apartments - Podruh says a critical test is viability. The prize is judged by a jury comprising of architecture, science and energy experts and the winners receive 30,000 Czech koruna, equivalent to EUR 1,170 while their sketch is converted into a life-size liveable prototype. The first two will be completed next year. When the prototypes are ready, the public will be able to rent them out for short stays to experience sustainable living. ‘Anyone can stay in these houses and try this new way of living and see that it’s not so different to what they are used to,’ said Podruh, whose organisation won first prize in the Young Energy Leaders category of the EU Sustainable Energy Awards in June. The organisation has no plans to commercialise the prototypes. Instead, their goal is to highlight the need for sustainable housing initiatives and spur governments, policymakers and private companies into action. SOLACE and LEMON are funded by the EU. If you liked this article, please consider sharing it on social media.